Changes affecting the mandatory carriage of life-saving and safety equipment are set to affect the UK fishing sector, with the forthcoming introduction of the Code of Practice for the Safety of Small Fishing Vessels. Due to enter force on 23 October 2019 as Marine Safety Notice (MSN) 1871, which will be enforced by the Maritime & Coastguard Agency (MCA), the new requirements represent a concerted effort by the industry to stem the tide of accidents involving small fishing vessels in the UK. Marine LSA supplier and consultant Ocean Safety Limited is subsequently providing a free advisory service to the UK fishing community, in advance of MSN 1871. Michael Scott, branch manager of Ocean Safety’s Greenock office, Scotland, tells Ship & Boat International: “A number of these vessels, especially the smaller ones, have not had to carry liferafts or emergency beacons before.” With this in mind, the relative novelty of carrying such equipment means that some fishing fleet operators could well benefit from advice on the kit they will be required to purchase. The new rules stipulate that ISO 9650-standard liferafts must be carried on the deck of all open vessels sized between 7-15m, and on all decked vessels sized up to 10m. The liferafts must be accompanied by SOLAS-B emergency equipment, either carried inside the raft or in a ‘grab bag’ carried by the crew. Fishing vessels over 10m in length must also carry either an emergency position indicating radio beacon (EPIRB) or equip all crew members with personal locator beacons (PLBs). Scott points out that the EPIRB must be a Category 1 model featuring an auto-release bracket with hydrostatic release, so that, in the event of the boat going down, the EPIRB can float to the surface. 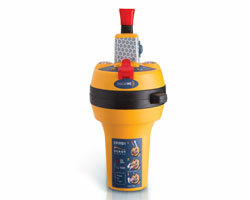 “The EPIRB might be a better solution for vessels with lots of crew,” Scott says. For “one-man band” fishing operations, or vessels with a small number of crewmen, it may be easier to give each member a PLB, which can be attached to their lifejackets. Either way, the fishing crew will now have the means to automatically transmit a distress alert on 406MHz and alert search and rescue coordinators on the 121.5MHz frequency. Ocean Safety is now working with the MCA and various UK fishing federations to answer queries, share advice and provide familiarisation sessions on how to launch liferafts, operate EPIRBs / PLBs and look after lifejackets. However, Scott warns, with an estimated 4,000 UK fishing vessels required to comply with MSN 1871, the fishing sector should not leave equipment-related compliance to the last minute: there is the risk that a sudden upsurge in demand for liferafts and emergency beacons could create a bottleneck in the supply chain, making these LSAs difficult or impossible to obtain before the requirements enter force.